Sneak Peek at March for Scrapbook Circle! Well, at about midnight last night Zoey woke up and we have now very well determined that we have not amazingly escaped ourselves from the flu and cold plague that everyone we seem to know here has been blessed to have had the past few months or so. Not fun. Not fun at all. At one point it felt as though I was holding a puppy with all her shivering and shaking from the chills. Poor sweetie...I hate it when she is sick. While she is sleeping though, I thought I'd quick share something that is fun. Very, very, fun! 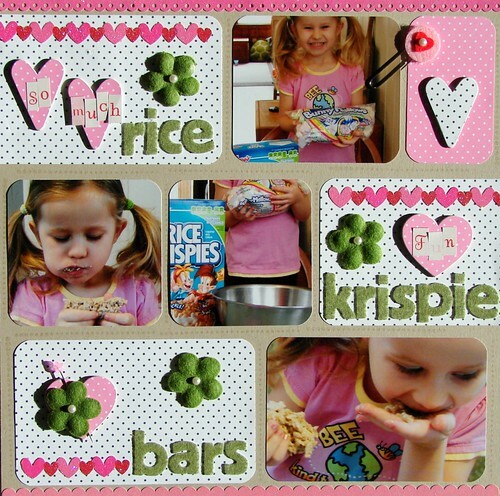 The March Kit sneaks from Scrapbook Circle! So excited to play with this kit and knowing that it's on it's way to my home right now is bringing a little bit of sunshine my way...even through my groggy, sleep-deprived, mommy stupor. Check it out for yourselves and then hurry on over to subscribe for this month's kit yourself! 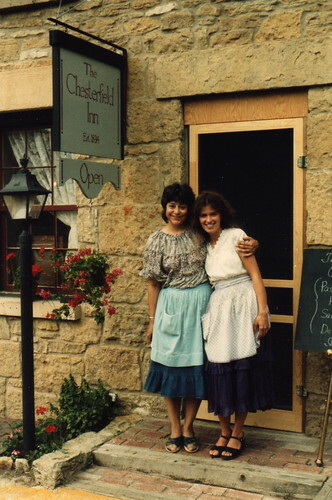 Be sure to stop on over to the Creative Imaginations blog this week. They are featuring artist, Samantha Walker and will be sharing a bit of insight on her designs, the process that she follows when designing, and of course projects done using her collections! 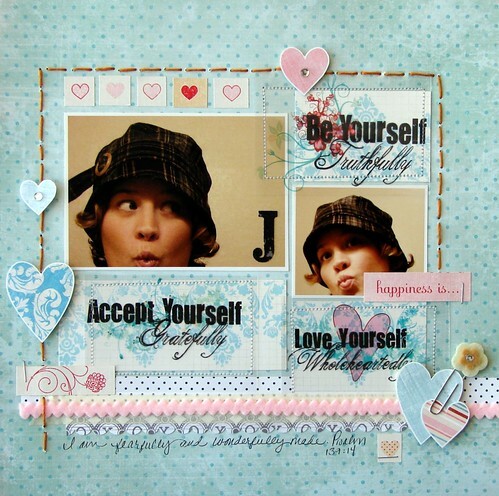 I think today they are featuring some of my projects done using Samantha's Day by Day Collection, (one of my favorites!). My grandmother is in the hospital right now. My mom is at her house cleaning and worrying I am sure, I spoke with her this morning. My mom took my grandma to the hospital yesterday due to my grandma finally admitting that she had some pretty serious back pain (turns out that she has three compressed vertebrae in her back), prior to her admitting just how bad it was she had assured my mom that she had endured this type of pain before, when she was pounding fence posts out in the field many, many, many, years back! One thing about all the women in my family (on my mom's side) is that we are all stubborn, but as someone told me recently, we do tend to get things done. Anyways, my grandmother is the one individual that I would have to say has influenced me the most when it comes to having a female role model. I have admired her for so many reasons and I have so many fond memories of her and stories that I've appreciated having heard that have been shared and passed along the way...she is quite simply, amazing. 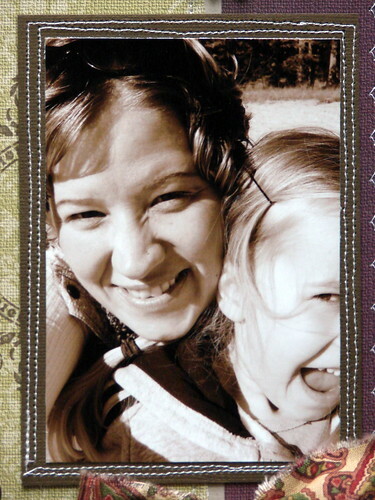 I wanted to send her a little something to let her know that I am thinking of her now but was stumped as to what would be appropriate now that she is in the hospital and bed-ridden and not feeling the best, and I finally had the thought to make and send a bookmark! She loves to read (as do I) and it would be something that she would use daily and appreciate I am sure. 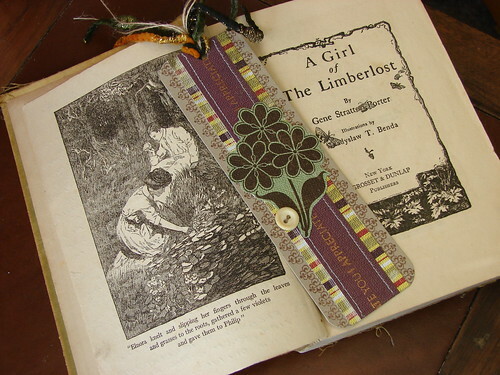 To create the bookmark I just used scraps from my latest layout that I did using Marks Paper Company patterned papers, I added a bit of cardstock, some fibers, a button and some stamping and I had my completed project. I can't wait for her to get it...she loves all the little things that I make and it makes me so happy to share my creations with people that truly appreciate them! 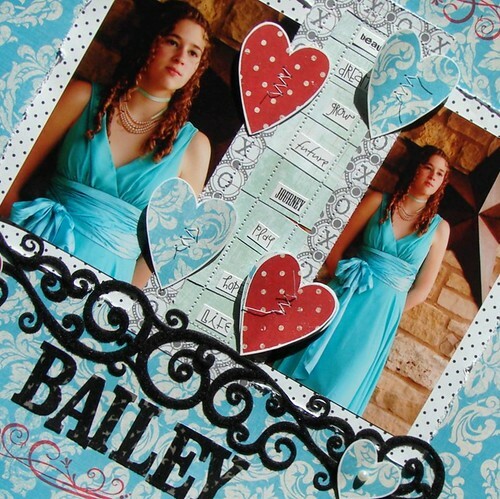 Cut cardstock to measure 2 1/4 inches x 6 3/4 inches, use your corner rounder punch on all four corners. 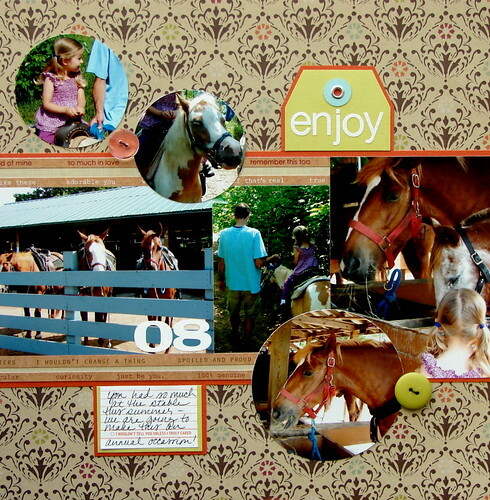 Cut a strip of your County Fair pp to measure 1 1/2 inches x 6 3/4 inches and adhere to the middle of your cardstock. In the middle of that, adhere a strip of Your Sunday Best pp measuring 1 inch x 6 3/4 inches and machine stitch along both sides of the pp. 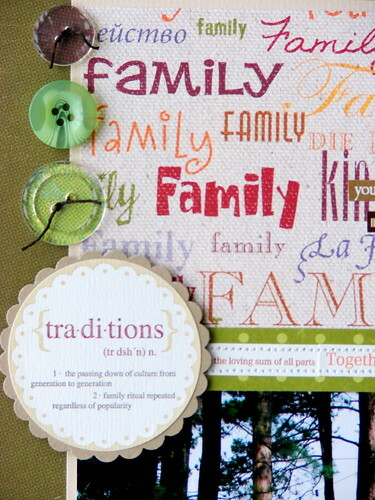 Using the Narratives Journaling Stamps (border stamp), stamp a border along both sides of your exposed cardstock. 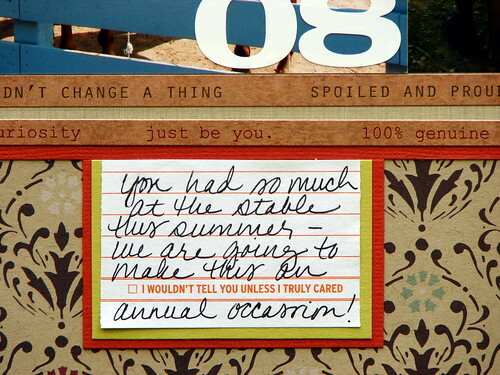 Using a phrase stamp from the Hero Arts Clear Design: All Occasion Messages stamp set, stamp along the center of the Your Sunday Best pp with Versamark Ink and emboss with Copper Embossing Powder. 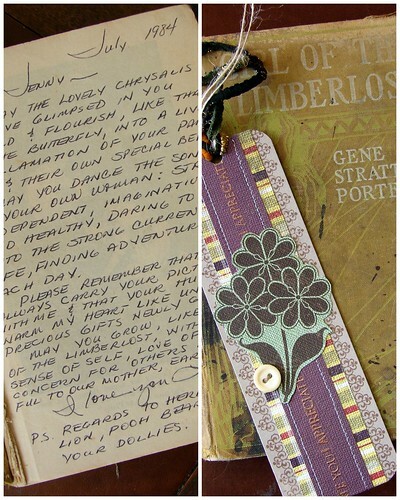 Using your scissors, cut out a flower from the Wildflowers pp and adhere this to the front of your bookmark and attach a button (that you inserted twine into) near the stem of the flowers. Last, punch a hole into the top of your bookmark and thread some twine and some of the Basic Grey fibers through the hole and you have yourself a pretty snazzy bookmark! What a gift! And the story of the book itself, carries it on to mean so much more. I'm going to re-read it now as an adult and see what it offers me at this stage in life. So anyways, this morning while thinking about my grandmother and how I admire her so, I was led to recalling a special relationship that I had forgotten between my mother and a friend...and the importance again of tending to those special relationships and celebrating what it is that is real and special. I am so lucky to have so many truly beautiful people in my life! And to leave you with just another something little that is fun...I got my first Marks Paper Company Newsletter in my mailbox this morning and it is fabulous! Be sure to sign up to get them for them yourself, lots of fun stuff is included within and loads of inspiration for crafty projects as well! Another Marks Paper Co. Layout! The trim that is tied in a bow is from Stacy Marks...she was so sweet when sending my first package of papers to include some special personal little touches and this bow was one of them so I thought it only fitting to include it on one of my MP layouts! That and it goes perfectly with this layout's color scheme! 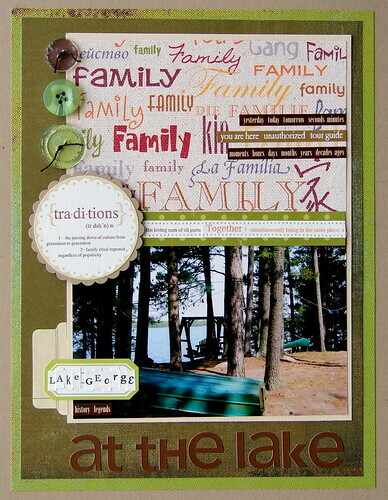 Tomorrow I am off to my local scrapbook store for an all day crop! My first ever crop and I am beyond excited to get to be a part of it...hoping to share more about how it goes after the weekend is through. I recently discovered the sketch site Pencil Lines (I know, I'm always late to what's cool and hip!) and am really having fun with some of their sketches and discovering that they are the perfect way to get me jump started and inspired for a project for those times when I am feeling the desire to create, but for whatever reason am stumped for where it is that I should start. 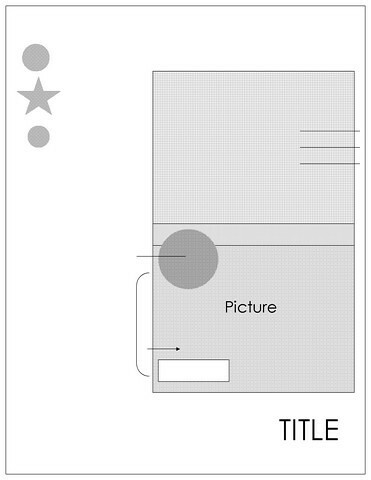 The layout above is one that I did using the sketch below. Today is the one day a week that Zoey and I are guaranteed to get to hang out all day together (no Pre-K, MOPS, etc. )...so we're off to get busy with having lots of fun! 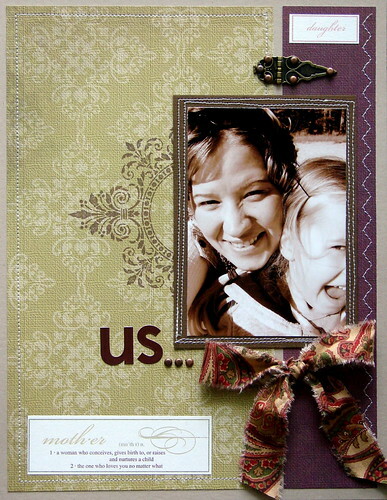 This layout uses some of the August Collection's patterned papers by Marks Paper Company. 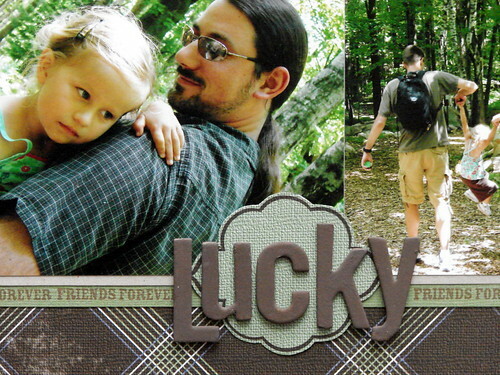 As soon as I saw these papers I knew that these were the photos that I wanted to use. When I asked my friend Aerque if it was alright to post photos of him and his wife Hillary online his response was first asking me if there would be any royalties that would come his way because of it, and when I replied no, he was quick to say a payment of cookies (no nuts) would suffice. Looks like some baking is in my future! For the stamping that I did along the green border strip along the bottom of the photos I used the new greetings stamp set by Hero Arts. Totally love how something so simple can add quite a bit of interest on your page without making it look too busy. 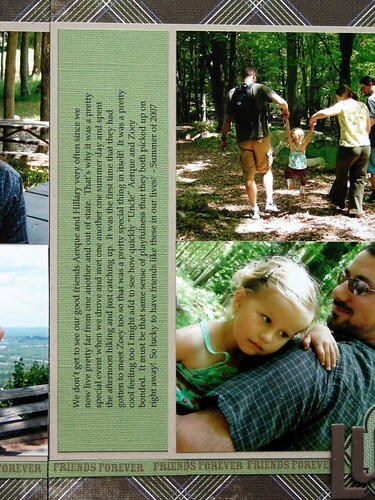 The journaling reads: We don't get to see our good friends Aerque and Hillary very often since we now live pretty far from one another and out of state. That's why it was a pretty special event when we drove and met one another one summer day and spent the afternoon hiking and just catching up. It was the first time that they had gotten to meet Zoey too so that was a pretty special thing in itself! It was a pretty cool feeling too I might add to see how quickly "Uncle" Aerque and Zoey bonded. It must be that same sense of playfulness that they both picked up on right away! So lucky to have friends like these in our lives! What Zoey's into here lately is the magical world of fairies. For Christmas we got her the book Fairy Houses by Tracy Kane, the DVD based on the creating of the book (really neat to see the connection made here between the book and the DVD), Kristen's Fairy Houses and a little kit that we found at our local independantly owned toy store by Creativity for Kids to create your own Fairy House. 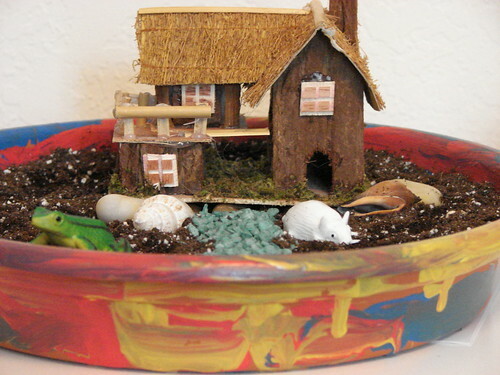 Included in the kit is everything that one would need for the creating of a Fairy House (a pot, potting soil, grass and bean seeds, little stones, rocks, shells, a little house and even some paint for decorating your pot!). I can't even tell you how fun it was for Zoey (and I) to arrange her little home for the fairies to hopefully come and visit, and planting the seeds and watching them grow (they were fast sprouting seeds) was even cooler. Really a neat process to get to go through with her. The book is just a beauty of a story for kids and adults alike. It leaves you with an appreciation for the outdoors and the earth as well as leaving room for the possibility that there may indeed be fairies that exist today...their spirits may live in the very things that surround us daily outdoors and in nature. This is the neat part in my opinion. It allows for fantasy to take on a place in reality and it's something that can help to teach respect and care for the outdoors and allow a little girl to be a little girl and feel good about it. Seems like there is so much expectation for little ones to grow up so fast these days, it's nice to have some little things to remind her that it's alright to believe that life may be just a bit magical after all. 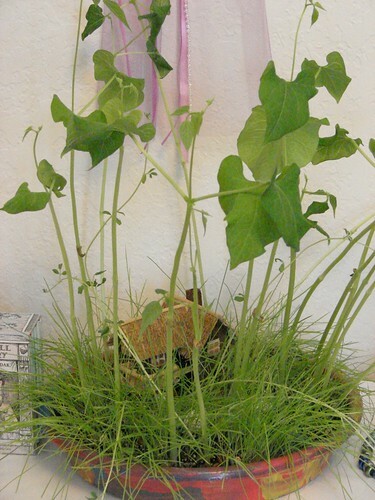 This photo was taken a couple of weeks ago already, the greenery is now bowing way over the pot and I think we may have to transplant the entire Fairy House sometime soon into a bigger pot. We are already researching on how it is that we can make our own Fairy House this Spring and Summer in the woods out back...if you do a google search there are a ton of ideas for making Fairy Houses. I love Tracy Kane's site especially, you can view ideas of how to create your ownr own and what supplies you would need here if you like. 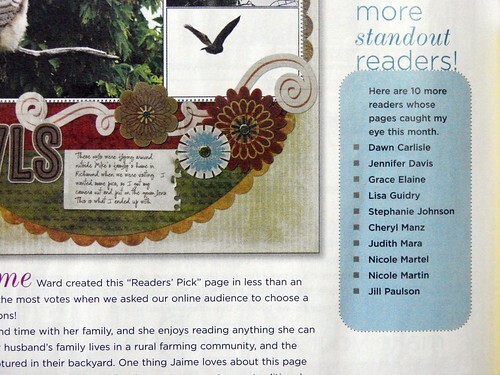 And just a fun share...I was reading my March issue of Creating Keepsakes the other day and found my name listed in the magazine under their more standout readers section! Yay! 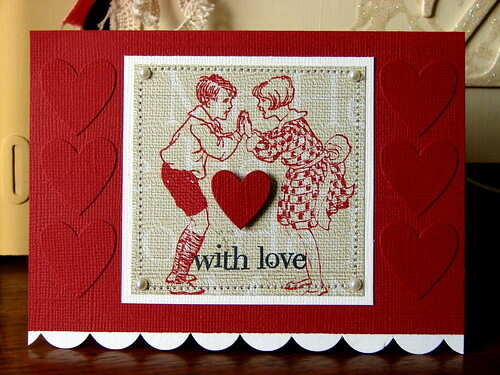 For this card I used the new patterned paper, He Loves Me from Marks Paper Company's Old Fashioned Courtship Collection. I used my Cuttlebug to cut out the hearts using Bazzill cardstock, added some pearl accents by Hero Arts, some stitching and the stamp that I used is by Heidi Grace. The scalloped trim border is actually by Bazzill as well, they sell some really cool border trims that are pre-cut. We are off to open gym this morning as Zoey has the day off of school due to teacher in-services. This afternoon I am hoping to finish up my craft idea for the next MOP's meeting. The trick will be seeing if I can find the things that I need for it here in town, if not, I'll have to think of something else for the craft entirely. We also have some special Valentine making festivities to attend to around here...something that Zoey is not letting me lose site of! Wishing you all a colorful weekend! Just a quick post of a recent layout today, things have been busy here lately! 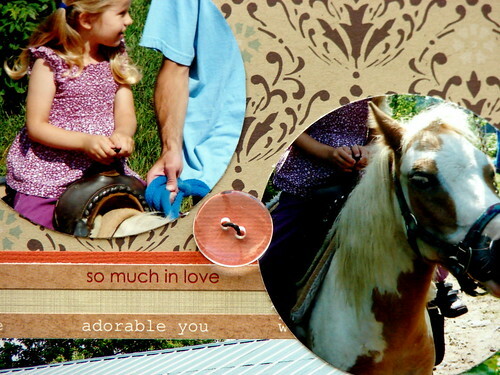 The photos are from last summer, I've done a layout with some of these before, but I couldn't resist using some more of them on a layout as they are just so cute! A tip on using tags: Often times I'll cut a tag in half and get more bang for my buck by splitting them and using them on the same layout or saving one half for another project completely, in this case I used one for providing a home for my title work and on the other half I wrote my journaling. 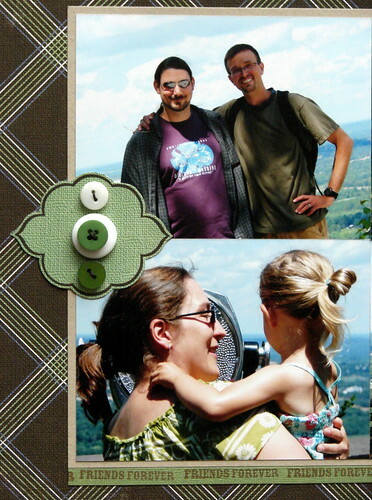 Again, I used the old putting patterned paper behind a clear button trick to "alter" my button. I received my first box of goodies from Marks Paper Company yesterday and am already getting busy with it...Stacy was so sweet to provide some extra-special little welcome gifts too, totally made my day! Also, check out a fun tutorial that I did on making paper flowers for Creative Imaginations over on their blog today. It's my first video and the sound is terrible, but I agreed to them posting it as long as they knew I could master the sound issue on future videos that are to come! That's all for today I think, Zoey's got bible class tonight so that means I'm off to pick up some pizza from our favorite take-n-bake place for dinner...have a good one! Last week I was so thrilled to receive an invitation from Stacy Marks to be a part of an exciting new venture that her and her husband and a few close friends are embarking upon by designing projects for their brand new company, Marks Paper Company! Their papers are not only beautiful, but they are designed to look like fabric (in the way that they look textured) and lately it seems I've been branching a bit more into textile-y types of things so this is just a perfect fit for me it seems. I also whole-heartedly love the designs of their first two collections that they are now shipping out to retailers (to order for your store and open a retailer account, click here). The colors and the designs are so rich and classic feeling, I can't wait to start playing with this stuff! They also are offering their papers as digital kits as well! To check out their collections yourself, check out their site here (or feast your eyes on the photos below!). To get a chance at winning a complete collection of one of the new releases for yourself, check out Patty's blog post here and leave a comment. She'll be choosing two winners by random and each individual will be receiving one of the paper collections! Thank you so much Stacy for letting me share in this journey with you! Just a quick post this morning to share some of what I've gotten done for the challenges over at Scrapbook Circle this weekend. The above card is for Jennie's "You've Got Mail" challenge (it's a Chick Flick Crop, so all the challenges are based on a favorite movie of the design team member that's hosting the challenge). The card was to be a tri-fold card and the above is what I came up with. Marcee's challenge is a sketch challenge that we were to use the sketch pictured above on and a photo that was somewhat beach related for the movie "Beaches." The layout below is what I ended up with and I love how it turned out! The photo is of a special place that has been in my husband's family for some time now and that many of his relations come to and gather to spend time with family and to connect with nature and the outdoors. It's been so special to have a place like this for us to bring Zoey and to spend time together as a family. I didn't have the exact color of buttons that I wanted to use for this layout so I simply cut patterned papers to be the size of the clear buttons that I had using my craft knife, using my paper piercer I then poked two holes and tied some twine through the paper and the clear buttons and had some new, perfectly matching buttons for my project! And just so you know, there is still time to join in on the fun this weekend over at Scrapbook Circle! Just join in the thread here and start creating! 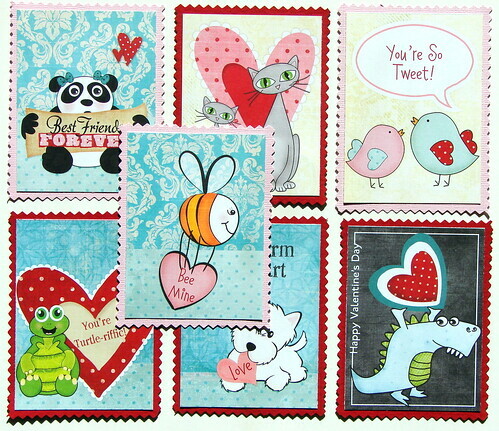 Chick Flick Crop @ Scrapbook Circle This Weekend! It should be a blast and everyone on the design team has challenges all set for the big event, complete with prizes, giveaways and more! If you're not already a member, be sure to sign up on the messege board here and you'll be all set and ready for a fun-filled weekend. And here are some more projects that I created using the awesome February Scrapbook Circle Kit (that's now available here). These Valentine's were super quick & easy using the adorable patterned Valentine paper by Fancy Pants that's included in this month's kit. To read my SC blog post about these, click here. Hope you decide to pop on over for some of the fun this weekend! I read this on Ali's blog this morning and it really struck a chord.